When I was still a stay-at-home mummy, I had all the time in the world to think of activities for my babies. Since we were on an income that was just enough to get us by, I would usually resort to DIY (Do-It-Yourself). With my daily browsing on tumblr, I came across a recipe (couldn't remember who the poster was though) which I will share with you. Now, I am sure that you would love that your kids feel your love by activities that you have prepared especially for them, right? OK, so let's cut the chase and get to it! So why did I categorize it under Recipes? Because it is totally edible! Beats the non-toxic finger paint you would buy at a bookstore. But don't get me wrong, it's not like you are aiming to feed it to your babies and toddlers, and don't even consider to FEED it, but it will definitely give you that peace of mind if it gets on their skin, hair or in their mouth. 1. In a small saucepan, combine all the ingredients. 2. Warm until mixture thickens. 3. Cool and pour in containers (as you can see in the photo above, I used Gerber jars). 4. 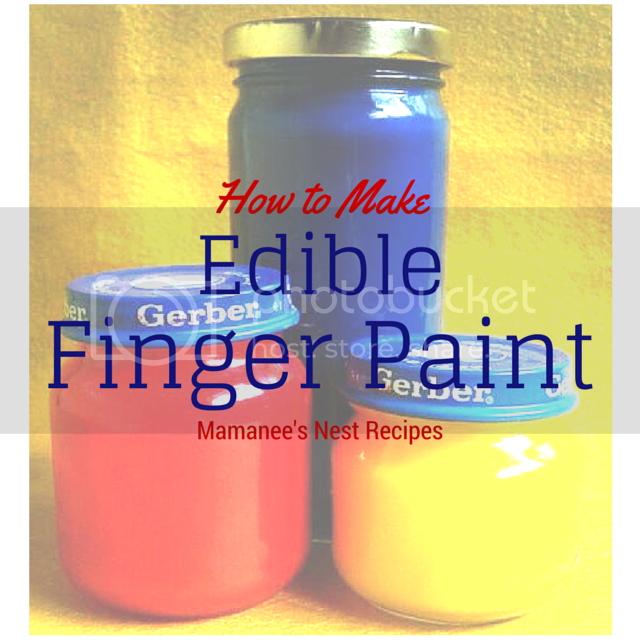 Add food coloring to create your favorite colors. Make them bright! You might be wondering how these finger paints worked out with the kids? Let me just show some throwback photos then. Your kids will surely love it to! Try it out and let me know below how it goes ok? I tried a no-cook recipe before. Since tamad ako, I bought washable tempera paints na for him to use. For this recipe, how's the shelf life? This is definitely better for babies compared to chemical-based paint. Ahh nice, I hope it's cooked since raw flour causes digestive problems in the long run. Been wanting to do this since Mila is now into painting and coloring. I'm just too lazy. Haha. Definitely better! I tried before a no-cook recipe; it actually just needs flour, water, and food coloring. I should try making that again! Just be careful mommy that baby doesn't get your mixture into his mouth since it's the flour is raw. It may cause digestive problems in the long run. This is a good idea. I hope I can try making this one. This looks like a perfect art activity for babies and toddler. Just in time for my second baby.. bookmarking. This sounds interesting and exciting. I hope I could try it soon. I just knew about this today! Thanks for sharing.